Here’s what happens when Alex visits the Alex Hotel in Perth. It’s not uncommon for East Coast Aussies to travel the globe before visiting their own backyard. Easier said than done when your backyard expands over 4000 km and Perth seems like a far away land that you’ll “get to one day”. Well, that day has come. Book yourself in for a long weekend and discover the wonders of this capital city. On this, my inaugural voyage to Perth I based myself at the Alex Hotel. Call it self-indulgent but there was something quite smug about staying at a hotel with my name on it. So take it from this Alex who’s stayed at The Alex this city has lots to discover whether you’re an Alex or not. Fried chicken buttermilk pancakes. Do I have your attention? 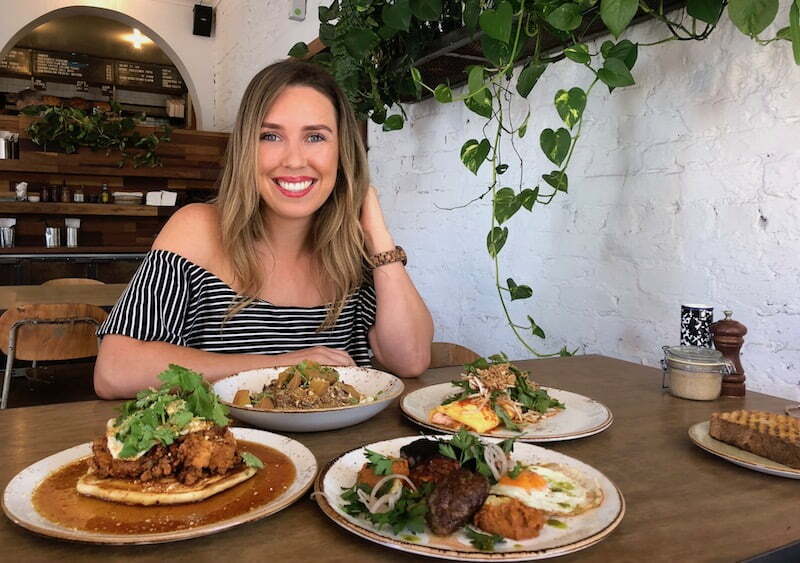 Add peanuts, maple syrup and a fried egg and you have the most indulgent breakfast in Perth. You’ll find it at Mary Street Bakery, a popular cafe in Perth with four different locations. As you’ve guessed this is no ordinary fried eggs on toast kind of fare. Other menu items include an Asian style smoked salmon omelette with nam jim and herb salad, a beautiful ceramic bowl full of chia bircher looks almost too good to eat topped with coconut yoghurt, puffed rice and crushed pistachios. If you’ve been out the night before order a bloody Mary or start your morning brunch with an organic cold pressed juice. Order a box of treats for later, their doughnuts are one of the main reasons the locals flock here. Located right next door to Alex Hotel is Shadow Wine Bar, a dimly lit restaurant filled with delicious drops and classic European dining. Open throughout the day and late into the night, Shadow Wine Bar is great for dinner or a quick bite and glass of vino before heading off to a show nearby. Their shark bay crab spaghettini is legendary and you’ll want to go early before the homemade spanakopita runs out. Zucchini flowers stuffed with Persian feta and romesco are great to share but you’ll want the pumpkin agnolotti with hazelnut picada all to yourself. Located in the historic heart of Perth are the State Buildings, a hub for hospitality, retail, wellness and luxury accommodation. 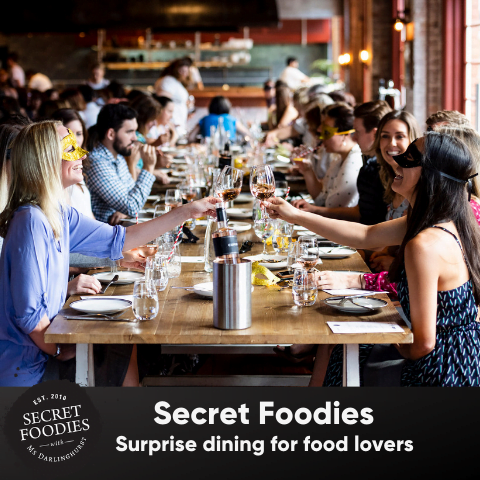 Here you’ll find some wonderful bars and restaurants including David Thompson’s Long Chim, an Italian osteria called Post, Petition Beer Corner and Petition Wine Bar & Merchant. Upstairs is luxury hotel Como The Treasury and fine dining restaurant Wildflower. But for a relaxed lunch book in to Petition Kitchen. Inspired by local producers, Head Chef Jesse Blake’s passion for fresh food has culminated in an assortment of rustic, wholesome dishes designed to share. Raw Geraldton kingfish served with sweet ginger and crème fraîche is a good place to start. 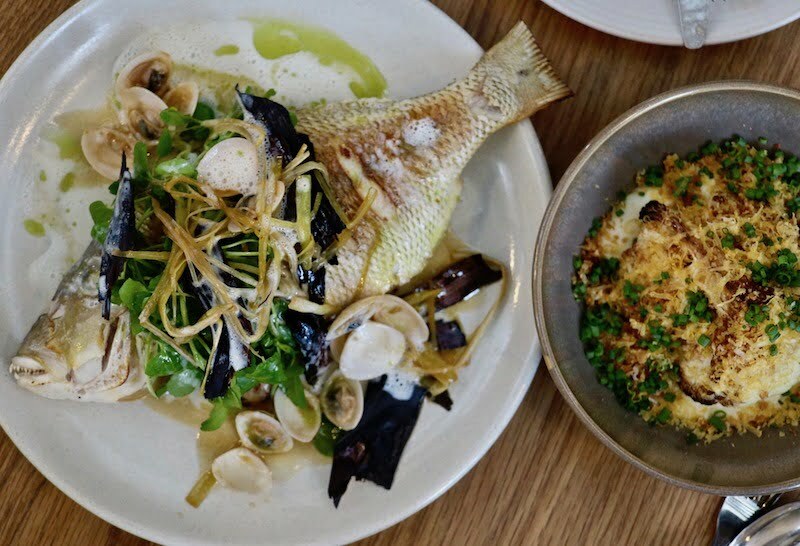 You have to order the charred cauliflower mornay with chive, smoked brioche and salted egg it goes well with the market fish served with charred leeks, clams and salt cod veloute. Leave room for dessert, interesting combinations include malted milk, peanut caramel, rhubarb and toasted oats and the unusual warm artichoke custard, soft chocolate and saltbush. Just around the corner from the Alex Hotel is ChiCho gelato. They make their gelato fresh every day in small batches. Every component is made onsite including their brownies, cookies, brioche buns, honeycomb, caramel, meringue and amaretti. Mandarin sorbet, burnt butter popcorn, spiced pumpkin gingersnap, avocado candied bacon, cactus fruit sorbet and green tea mochi cake are just some of the unusual flavours they’ve created. Go for a dip in Cottoesloe Beach then make your way to Canteen Pizza for a long and lazy lunch. 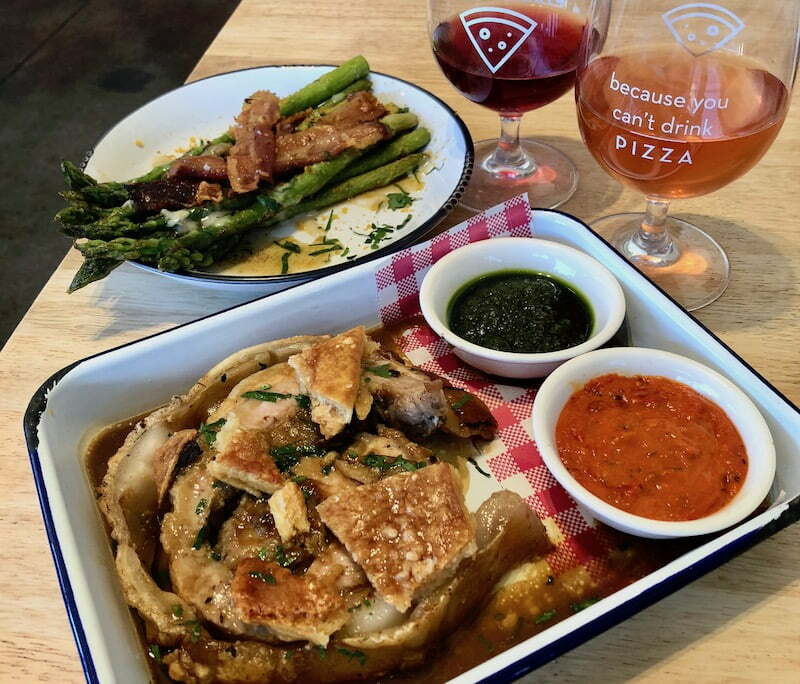 Their pizzas are naturally risen for 48 hours and 100% handmade and cooked in a wood fired oven. But even if you’re not a mad for pizza there’s plenty to order including whole fish or pochetta with rosemary, butter and garlic sauce. The salad of white anchovies, green olives and rocket comes served with warm bread. Couple this with a basil pesto, tomato and buffalo mozzarella salad and a bottle of natural wine. Save room for a buffalo ricotta cannoli to finish. This was one of the first small bars to pop up in Perth. You’ll find it hidden in a cobblestoned back alley amongst the office towers of Perth’s Central Business District. Take note whiskey fans, Helvetica Bar have bottles from all over the world. They event have a bottle-keep service where you can purchase a bottle of your favourite whiskey from the bar and they store it for you under lock and key. Entertain friends with your own bottle. They also have a range of cocktails, wine and beer plus light snacks. Perched above COMO The Treasury is, Wildflower, a stunning rooftop restaurant. The elegant, contemporary steel and glass box is located on the hotel’s fourth floor looking out over the city. Inside the restaurant Western Australia born Executive Chef Jed Gerrard serves contemporary dishes revolving around the indigenous ethos of six seasons with farmer and forager-driven menus. Book in to the restaurant for lunch or take in the sweeping views from the 30 seater bar and outside terrace area. This bar is for the gin lovers out there. This inner-city bar occupies three levels of a historic 100-year-old flour mill and is walking distance from the Alex Hotel. They have over 100 gins on the back bar, make their own tonics in house and have a seasonally changing cocktail menu. No trip to Perth is complete without a visit to the popular suburb of Freemantle. Here you’ll find the Little Creatures Brewery. What started out as a couple of hophead mates making pale ale in a shed has turned into a huge globally recognised brand. Even if you’re not a huge beer lover it’s one to tick off the Perth bucket list. The ferry to Rottness Island leaves from Freemantle so spend the day on the island and make plans for dinner at the brewery on your way home. A pale ale and pizza in the great hall has your name all over it. Henry Summer is an urban garden oasis located in the heart of Northbridge, a short walk from Alex hotel. The large bar is covered in plants from floor to ceiling and instantly makes you feel relaxed. The food is ok but you’re really here for the decor and drinks. Order a bottle of wine and spend an afternoon relaxing amongst the ferns. Known to the locals as the “cray pot’ this new stadium does in fact resemble that of a lobster trap. The 60,000 seat, world-class, multi-purpose stadium opened earlier this year and hosts a variety of sports and entertainment. We were lucky to see Ed Sheeran perform to a sold out stadium on our trip. If heaven is a place on earth chances are it could be Bohdi J Day Spa. 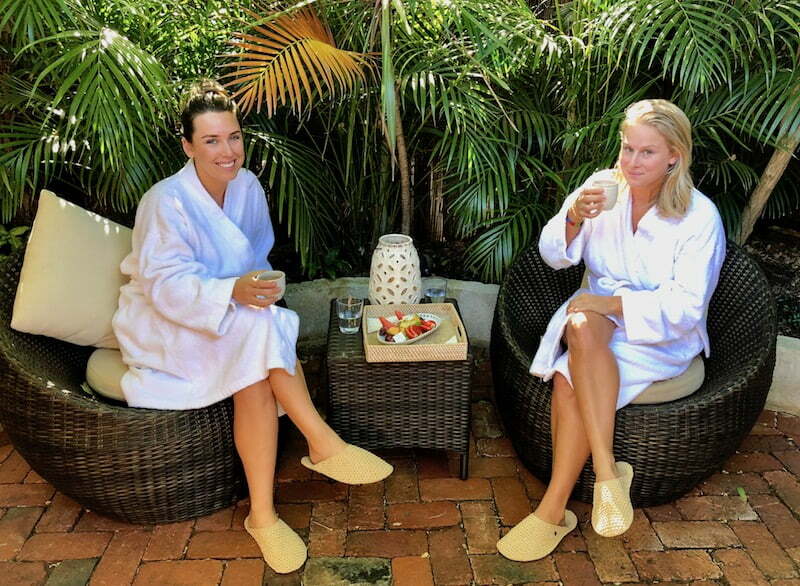 This organic day spa is a must for anyone who loves a little pampering. They offer a range of services including massages, facials, body and healing therapies, spa treatments and more. Discover the power of the ‘healing touch’ with a deep tissue massage. You’ll find yourself floating out of there at the end of your experience. Cottesloe Beach is one of Perth’s most popular swimming beaches and a short 15 minute train ride from Alex Hotel. It’s lined with cafes and restaurants making it the perfect spot for a post-swim drink or relaxed lunch. Watch the sun set over the Indian Ocean then visit the local bars for sundowners. One for the diary- in March the annual Sculpture by the Sea outdoor exhibition turns the beach into an outdoor art gallery. Why would I want to work out on holidays, I hear you ask? If you’re anything like me and plan your holidays around eating and drinking you’ll want the chance to earn back some of those calories. Plus it’s fun discovering different kinds of workouts that you might not normally try. LAFit is a small boutique gym offering three different types of classes: Lagree Fitness, Ride and MegaRide taking pilates and cycle to the next level. It’s also not far from Alex Hotel. 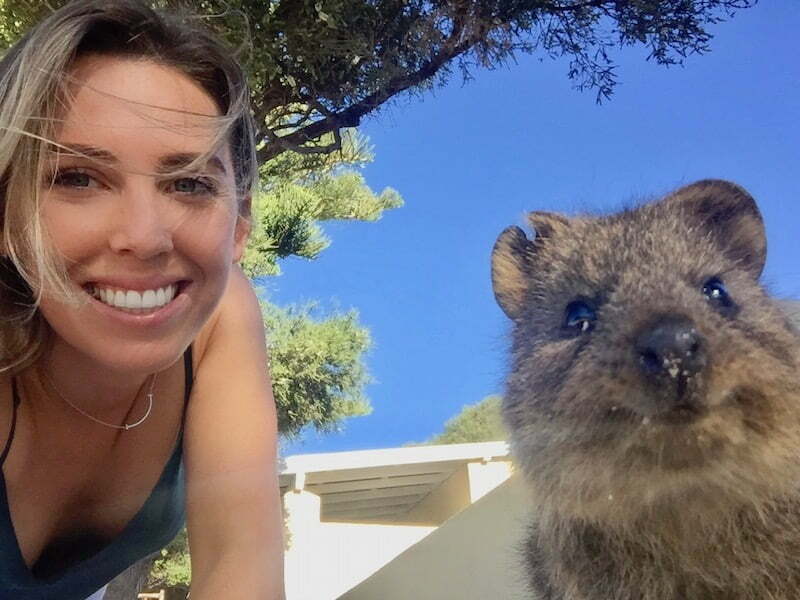 If you’re heading to Perth make sure you factor in a day trip to Rottnest Island. Known as Rotto to the locals this picturesque island is home to colonies of Australian sea lions and fur seals, a number of native and introduced bird species and of course the cute little quokkas. There are no cars on Rottnest Island so the best way to get around by bike. You can hire these along with snorkeling gear from Rottnest Express when you book your ferry across from Fremantle. But the most fun way to see the island is by an adventure boat tour run by Rottnest Express. Jump aboard their purpose-built high-powered vessel and enjoy a 90 minute guided tour of the island. Explore the rugged coastline and witness the beauty of its abundant wildlife up close. After your boat tour head to Tomsons Rottnest for lunch and order a large pot of mussels, BBQ pulled pork sliders, grilled Freemantle octopus and more. Alex Hotel is a boutique hotel located in Northbridge, the centre of Perth’s arts and cultural precinct with the Art Gallery and Heath Ledger Theatre right next door. You’re a short stroll from the CBD and the train station making it a great base for your trip. Here are eight things I love about the Alex Hotel. The honour system bar- On the mezzanine level is a bar stocked with a great selection of local craft beer, wine and artisan spirits. Just take what you like and fill out an honour card. You’ll be charged at the end of your stay and prices are very reasonable. The staff- you’ll find some of the most down-to-earth staff at the front desk, eager to share local knowledge. The Rooftop– pop upstairs at night and enjoy sweeping views of the Perth skyline. It’s living spaces – I love that The Alex feels like you’re staying at someones home rather than a hotel. It’s always a good time to visit Perth but if you’re looking at attending a major event here are some of the main attractions throughout the year. To enter tell us in 35 words or less what you’d most like to see in Perth and why. Write your answers in the comments section below. Terms and conditions: The competition commences at 5:30pm AEST Wednesday 4th April 2018 and ends at 5.00pm Thursday 26th April 2018. This competition is open to all residents aged 18+ in Sydney and Melbourne only. All elements of the prize must be redeemed together, as a package, by Friday 30th November 2018. 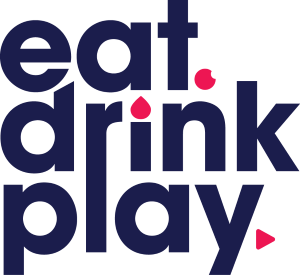 By entering, each entrant agrees to receive offers and promotions from Eat Drink Play and The Alex Hotel. This competition is a game of skill. All entries will be judged individually on their merits based on creativity and originality of the entrants response. The best entry, as determined by the judges, will receive the prize. **I travelled to Perth as a guest of The Alex Hotel. They kindly hosted this famil.